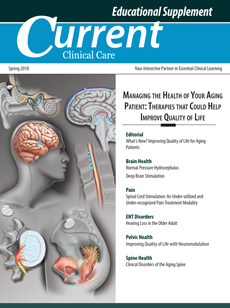 This supplement provides an overview of innovative therapies and their impact on improving the quality of life in aging patients. Deep brain stimulation has become widely accepted as a treatment for Parkinson's disease (PD), dystonia and tremor, and as an off-label treatment for many other movement disorders. Hearing loss has a profound impact on an individual. A hidden disability, hearing loss disrupts the way we communicate and ultimately limits our ability to socialize and engage with others. Sacral neuromodulation (SNM) is Health Canada authorized for the management of chronic intractable (functional) disorders of the pelvis and lower urinary or intestinal tract. Hydrocephalus describes a clinical entity characterized by the excess accumulation of cerebrospinal fluid (CSF) within the brain, primarily in the ventricles. In spite of the slightly increased incidence of infections, malignancies and systemic illnesses affecting the older spine, about 90% of back pain in the elderly, as in younger patients, is mechanical. There is increasing concern in Canada about the overuse and misuse of opioids.